When you grill fruit the natural sugars caramelize on the outside, while the flesh remains firm and juicy beneath the charred grill marks. Grilling brings out the inherent sweetness in the pineapple. Using canned pineapple might not work as well for grilling because of the added syrup and moisture content. Pineapple is fairly low in calories and high in dietary fiber. Pineapple has 80% of the RDA of vitamin C, making it a great immune system booster to fight off infections. The fruit also contains bromelain. Bromelain is a digestive enzyme that breaks down protein. You can find complete nutritional information for pineapple at nutrition-and-you.com. Let’s take a look at a basic grilling recipe and then we’ll discuss additions to make it pop and what to do with it once it is grilled. You have the option here to grill 1/2″ thick pineapple rings or to cut the pineapple off the core into 1” chunks and grill between the ridges on wood skewers. Preheat the Foreman Grill to 375° F.
Meanwhile, cut the top and bottom off of the pineapple. Then, slice the skin and eyes off of it. Either slice into 1/2″ rounds or cut off the core and then into 1” cubes or pyramids to skewer. Place the rounds or skewers, not touching each other, on the hot grill and close the top. Check after 3 minutes for char marks. You may need to cook a minute or so longer. Another popular way to grill pineapple is with a light dry rub coating of a mixture of brown sugar and cinnamon. 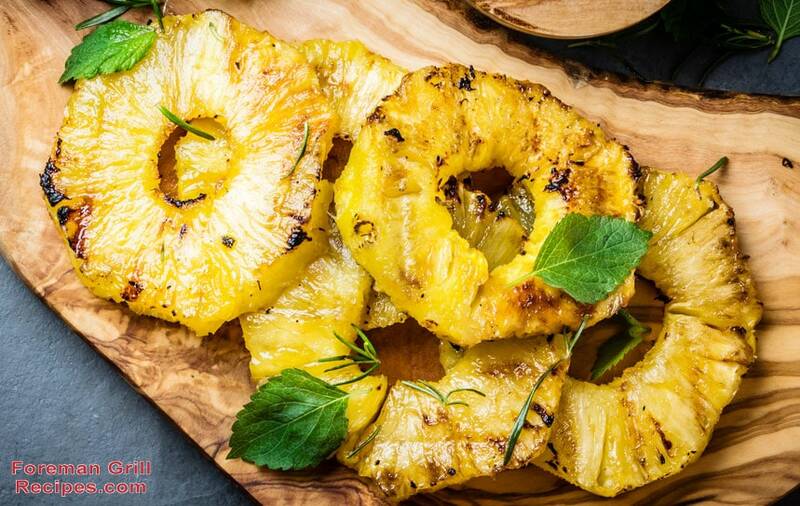 Grilled pineapple is delicious just plain as a snack. But, there are several things you can do with it. Here are some suggestions and links to recipes. Use grilled pineapple as a garnish on a pina colada or a pineapple margarita. Make a sweet salsa for dipping chips into, spooning onto tacos, or served over grilled chicken or fish. Here is a recipe from Serious Eats for grilled pineapple salsa. Grilled ham and cheese sandwiches are great with grilled pineapple in the middle. This recipe from Martha Stewart doesn’t call for grilling the pineapple, but that would be an added treat. Plus, you will already have your Foreman Grill ready to make the sandwiches. Of course, we can’t forget dessert. Elli Krieger, from the Food Network, has a super simple grilled pineapple with rum sauce and vanilla ice cream. You can get it here. And, if you are a fan, you can top your Hawaiian pizza with grilled pineapple. Just like protein, vegetables, and sandwiches, you can grill fruit on a foreman Grill. Aside from pineapple, you can also grill stone fruits, apples, pears, citrus, and even tomatoes. Grilled fruit is very tasty and it doesn’t diminish the nutrients that are inherent in the raw, fresh fruit. You can wow your friends and family with grilled pineapple at your next gathering.